By Craig | February 2, 2019 | This post may contain affiliate links, which means we may receive a small commission, at no cost to you, if you make a purchase through a link. Read our Disclosure. 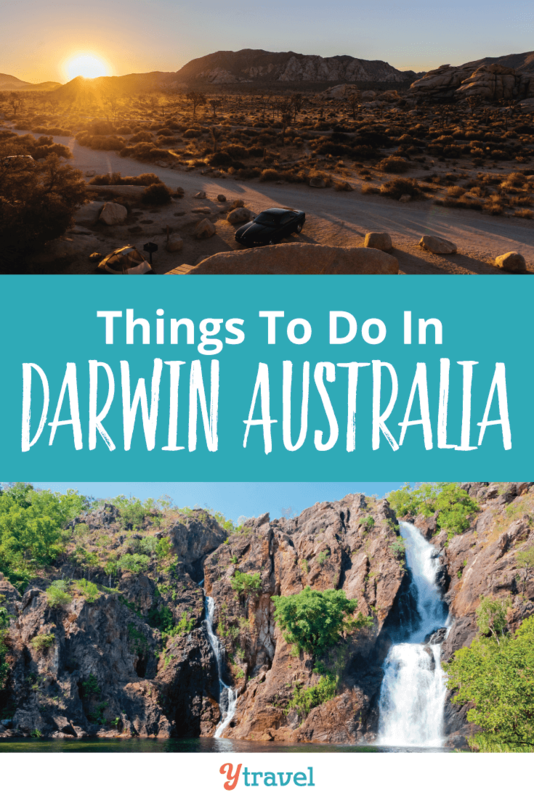 Are you looking for tips on things to do in Darwin, Australia? As part of our city guides series, we share with you our insider tips on the best things to do in Darwin, including advice on where to eat, sleep, drink, shop and explore. 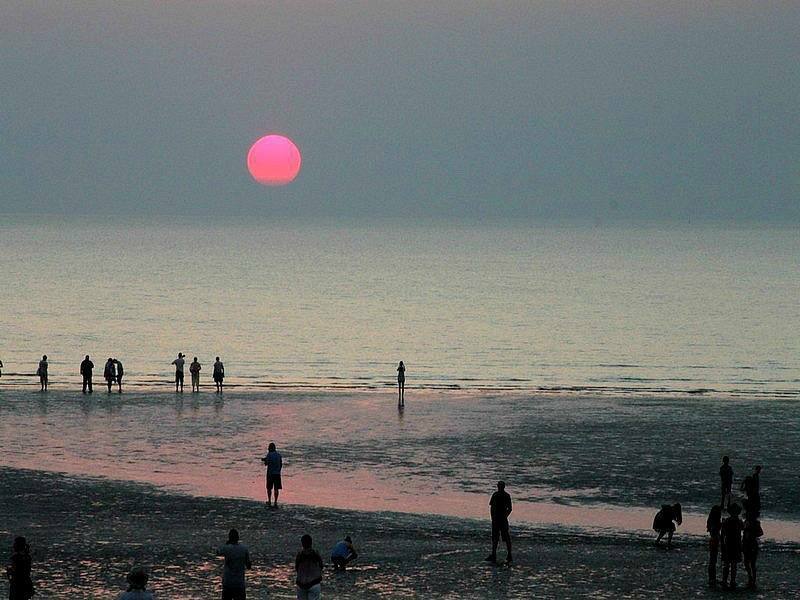 Darwin literally is a HOT destination. While Aussies in southern parts of Australia are all rugged up on the couch under a blanket in our winter woolies, those in Darwin are basking in the warmth of the sun. It’s the perfect winter getaway. 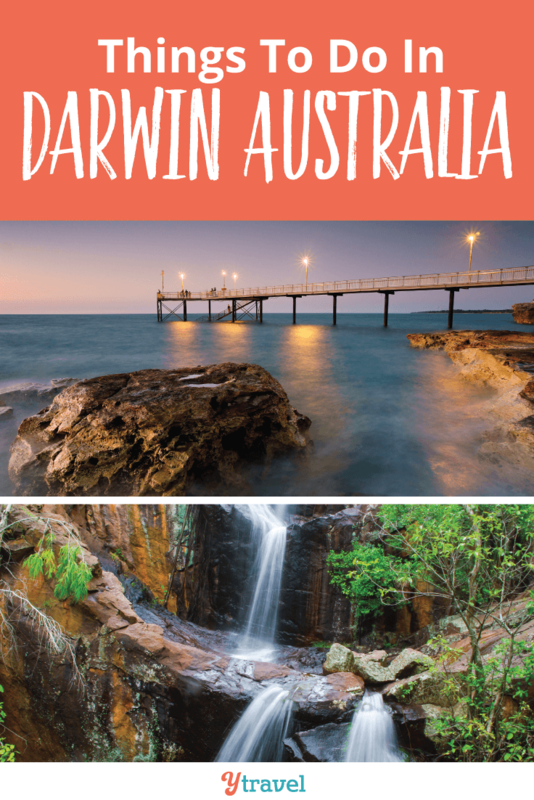 A vibrant, multicultural and unique destination, Darwin offers a gateway to natural and cultural icons of the Top End, including the Tiwi Islands, Litchfield and Kakadu National Parks, Adelaide River, Mary River, Arnhem Land and the Katherine Region. There are plenty of things to do in Darwin to appreciate Aboriginal culture. In Darwin, you can take things as fast or as slow as you like. From bushwalks and suburban markets to being submerged with saltwater crocodiles, it really is your choice in this modern, tropical city. A trip on the calm waters enjoying the tropical breeze is a must-do for any visit. Sit back and enjoy fiery-red sunsets while sailing the harbour on a classic pearl lugger, catamaran or seacat, Champagne in hand. Or stay on land and head to the Ski Club, Sailing Club, Trailer Boat Club or Mindil Beach for a cold beer to witness one of those iconic sunsets. Adelaide River, 70 km drive from the city centre, is a perfect habitat for Salties (saltwater crocodiles). Seeing one of these 4.5m giants jumping from the water right next to your boat is something else. So is swimming in the ‘Cage of Death’ at Crocosaurus Cove in Darwin’s CBD. Or for the faint-hearted, meet Sweetheart – 5 metres long and safely stuffed – at the Museum and Art Gallery of the NT. A metre-long slab of silver (Barramundi) haunts every fisho’s dreams. And in Darwin, dreams come true – on tours, in your own chartered boat and even off the shoreline or jetty. Barra action is hot in the run-off but can be had all year round. Sculpture, weaving, prints, paintings – all are on show or on sale. 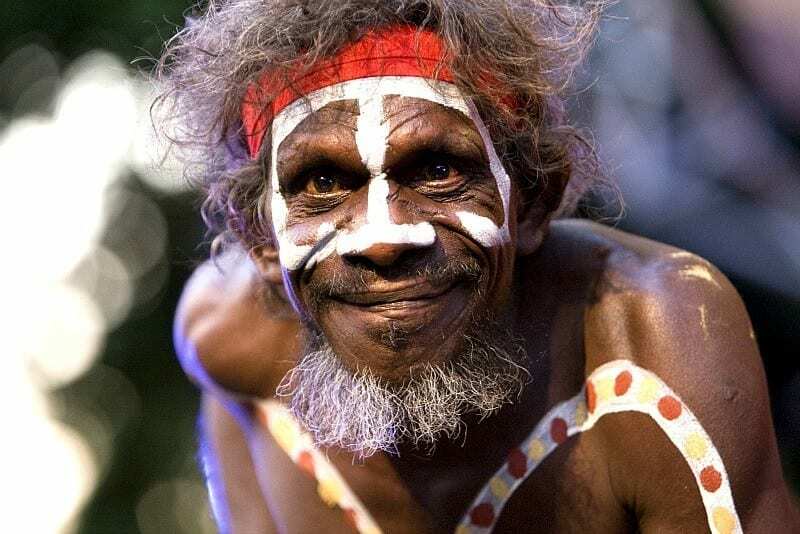 Try the Didgeridoo Hut, showcasing and selling original, authentic Indigenous artwork; the galleries in Parap; the Museum and Art Gallery of the NT or walk the shoreline in the company of a Larrakia guide to see this country through indigenous eyes. On 19 February 1942 an unprepared Darwin was devastated by Japanese bombing. Despite 58 further raids, Darwin rose to the challenge, becoming a major forward base for the Pacific Campaign. Discover WWII stories in the ruins at the East Point Military Museum and the Oil Storage Tunnels. Litchfield National Park is only an hour’s drive from the city. Crystal-clear waterfalls, swimming holes, four-wheel driving and easy-going bushwalks are just the start. You can join a full day tour to Litchfield if you don’t have your own vehicle. 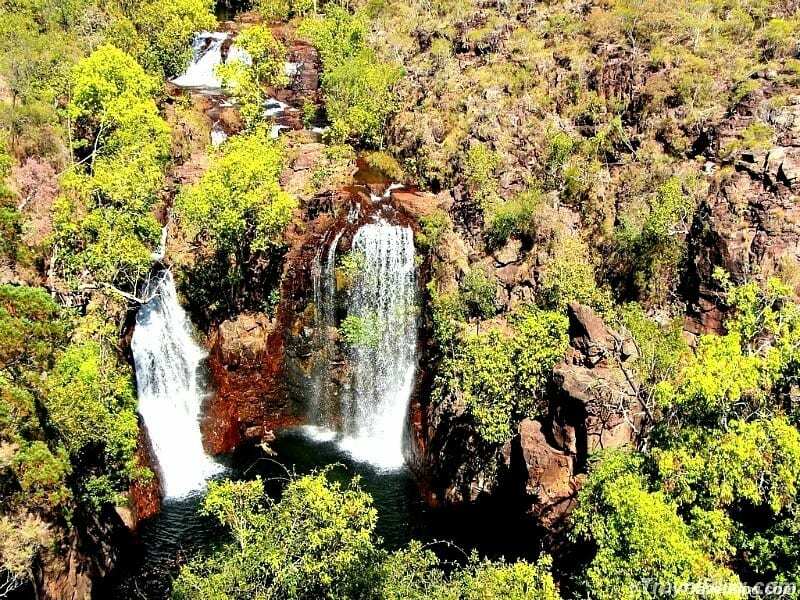 A trip to Litchfield National Park is one of the best things to do in Darwin. Darwin’s newest hang-out is the Waterfront precinct, in the heart of the city. The wave pool and swimming lagoon are surrounded by chilled-out cafés, bars, shops and restaurants. For a stroll, a drink and a choice of places to eat, the Waterfront makes a relaxed alternative to buzzing Mitchell St. The pumping nocturnal scene round the clock at Mitchell Street’s pubs and bars makes this strip a hot-ticket backpacker destination. With such close proximity to Indonesia and the rest of South-East Asia it’s no surprise that Darwin’s cuisine has a heavy Asian influence. 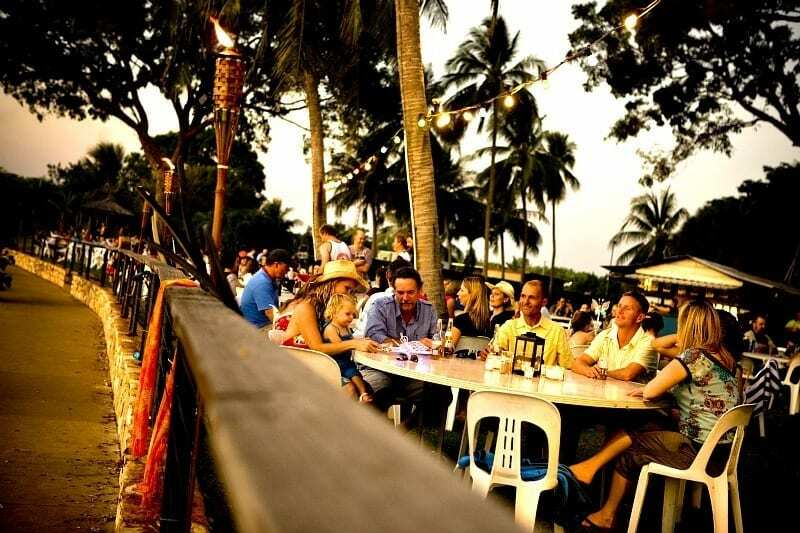 Fantastic restaurants are all over Darwin’s waterfront at Stokes Hill Wharf and Cullen Bay. With so many awesome activities to do during the day, it’s a good idea to grab a solid breakfast for the day ahead. The Cool Cafe is the local’s choice. As its namesake suggests, Moorish Cafe offers delicious Moroccan, Spanish and Mediterranean-influenced tapas. Enjoy the sangria from a settee piled high with colourful cushions. It may not be Vegas but Darwin caters to the risk taker at the SkyCity Casino. Try the Sandbar for a pre-dinner cocktail, il Piatto for Italian fare, or Evoo for a fully-fledged degustation menu. Head along to Stokes Hill Wharf to enjoy seafood platters that will put most others to shame. 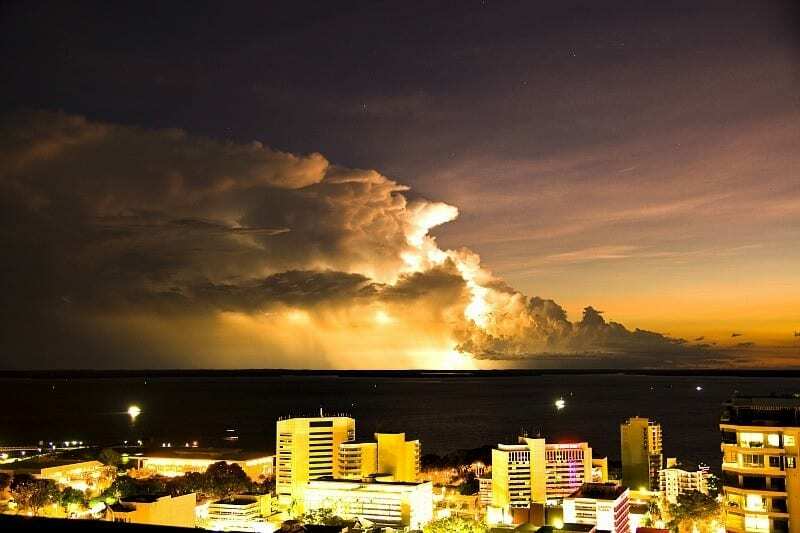 This is the place to go to see one of Darwin’s iconic thunderstorms roll in on the horizon. One of the locals’ favourites, Hanuman offers a mixture of Thai, Indian and Nonya cuisine in a relaxed yet sophisticated environment. Grab a table on the deck and marvel at the craftsmanship of the wooden displays on show. The Trumpet Mushrooms can’t be missed. Once a secret amongst the locals, Yots is the place to go for the freshest oysters in Darwin. Watch them being freshly shucked on the boardwalk while watching the yachts sail in to dock; one of the prettiest locations in Darwin. One of the lesser known but top-rated restaurants in Darwin, Thailicious draws influence from its close proximity to Asia to serve world class Thai cuisine. The Drunken Noodles are a hit. Set in the historic Admiralty House, Char Restaurant is known for its steaks but excels in seafood too. Lounge outside under the trees, favoured by Darwin’s corporates on a Friday afternoon, or sit inside and watch the bartender mix up a tropical concoction. Sweet Tooth is a family owned and operated Greek patisserie in the suburb of Millner, the pastries baked on premises, like the shortbread and Baklava, are worth the visit, and give visitors a little taste of the large Greek community Darwin is home to. 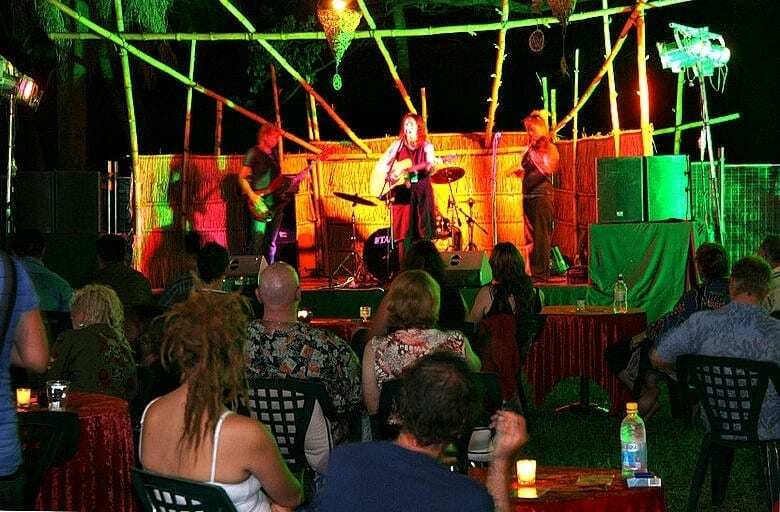 After fire ravaged through this offbeat live music venue in 2009, the Railway re-opened its doors to become host to some of the best live gigs in Darwin. Originally opened as a club for railway workers, this iconic watering hole has a history as rich as the regulators who frequent its old wooden bar. Serving up fishbowl cocktails to share with friends and a giant tree smack bang in the middle of the bar, The Tap is well-loved with the backpacker set which live along the Mitchell Street strip. A great example of the locals’ outdoorsy lifestyle, the Ski Club is a Members Club but also welcomes friends to its palm tree-fringed venue. As the sun sinks over the horizon, coloured fairy lights switch on and often a live acoustic guitar keeps the locals coming back every night of the week. Melaleuca on Mitchell Darwin YHA Hostel is the friendly option on popular Mitchell Street in the city’s entertainment precinct. Vibe Hotel – located in Darwin’s Waterfront, on the fringe of Darwin CBD and is perfectly positioned to explore Darwin’s newest restaurants, boutique shops and seafront promenade. 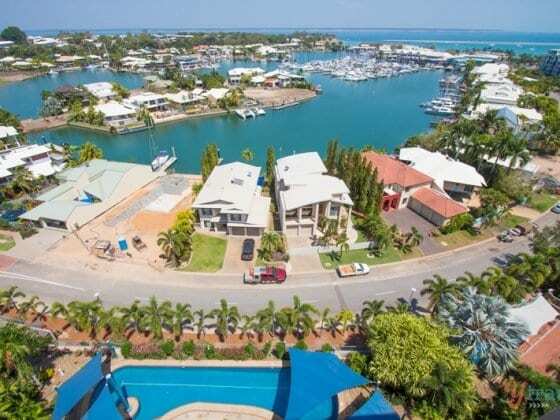 Hilton Darwin – excellent location just a few minutes’ walk from downtown in the vibrant Darwin Harbour area, and steps from fantastic shopping, dining and entertainment. Ditch the traditional hotel experience and have an exclusive taste of bush luxury in your own safari suite, at either Wildman Wilderness Lodge or Bamurru Plains. For more places to stay in Darwin choose from the largest range of hotels, apartments, and guesthouses with our partner Booking.com. You get free cancellation on most rooms, and in most cases you only pay when you stay. Darwin is a vibrant mix of cultures, and every one of them has a stall at the open air markets. Mindil Beach Sunset Markets, held Thursdays to Sundays from March to November, are the place to go for something tasty to eat, and stunning sunsets. 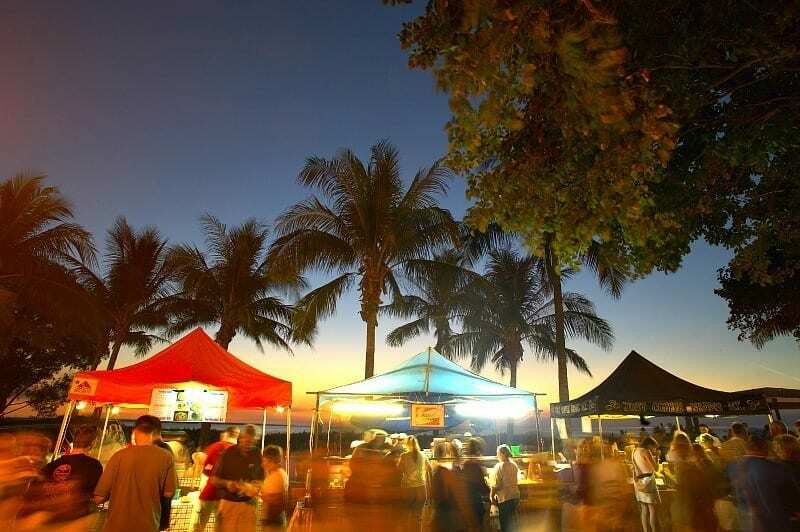 See a vibrant mix of cultures and food from around the world at these open air sunset markets. The Darwin Festival takes place every August, providing a feast of local, national and international performances to excite, inspire and entertain, including everything from free outdoor events to theatre, dance, music cabaret, films, workshops and comedy. 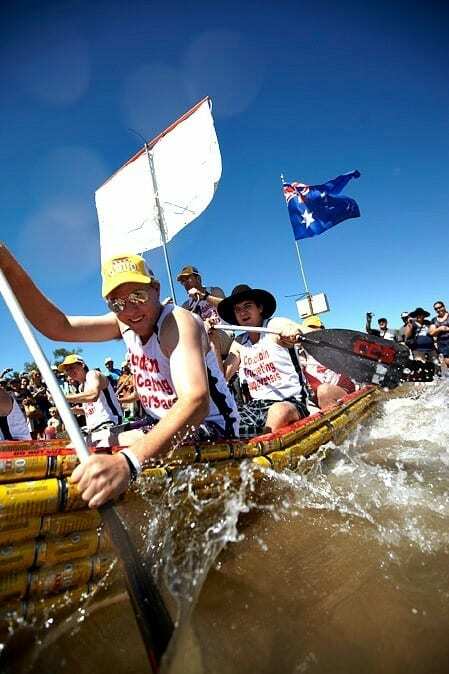 The Beer Can Regatta is a day of hilarity as spectators line the beach and watch these sometimes elaborate and often hopeless boats sink and fall apart in the Darwin Harbour. The main event being the Battle of Mindil draws the crowds, but the day is filled with amusing events like thong throwing and tug-of-war. Football is more than a game on the Tiwi Islands. It is a passion some would say stronger than any religion, and the grand final of the local league held in March each year is no better place to witness this craze. This is also the one day of the year that the art centres hold a sale of their works, and travel to the islands can be done without the usual permit restrictions. Share in the excitement of Darwin’s premier horse racing calendar with the Darwin Cup Carnival, where the ladies can show off their finery and enjoy a sumptuous luncheon and glass of bubbly on Ladies Day while 19,000 people burst the rails of the unique dirt track Fannie Bay Racecourse track. Public buses operate seven days a week, making it easy to get around Darwin on your own. Coach services can take you between regional and urban centres, and there’s a range of guided coach and bus tours if you’re after someone to show you the sites. A useful tool is the Darwin Public Transport Journey Planner, on the Transport NT website. Or even better: traverse the Northern Territory on two wheels! The Territory is great for cycling with plenty of cycle paths, and tracks and trails in national parks and urban areas. Free wireless internet is available in the Smith Street Mall of Darwin. To access, click on the connection labelled City of Darwin to view terms and conditions, accept, and one hour of free wireless is activated and can be repeated every six hours. Hotels across the city also offer WIFI; costs vary. 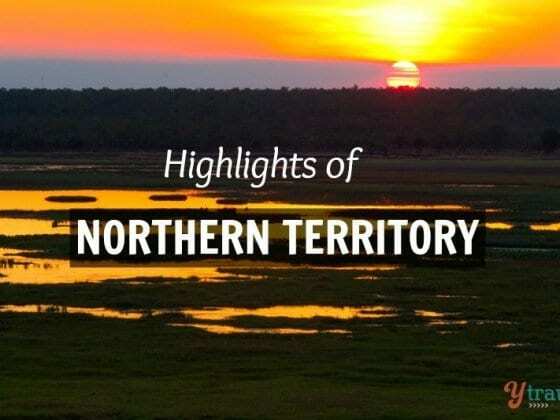 The peak visitor time to the Top End is during the dry season, from May to September, when a huge array of festivals and events are held due to the predictable 32 degree Celsius climate. Established in 1974, every Saturday at East Point Reserve Darwin from 6pm (BYO) The Darwin Rock Sitters Club captures the city’s tradition of spinning a few yarns and having a few beers with ‘ya mates’. This steamy local haunt for bearded and crusty locals hosts the Viking Funeral every July as a tribute to fallen sailors. It coincides with the moon rising over Frances Bay and culminates in a Viking boat funeral pyre. Darwin’s Ice Hockey Club are the world ice hockey champions who defend their title from Darwin’s melted ice – for more information, visit here. 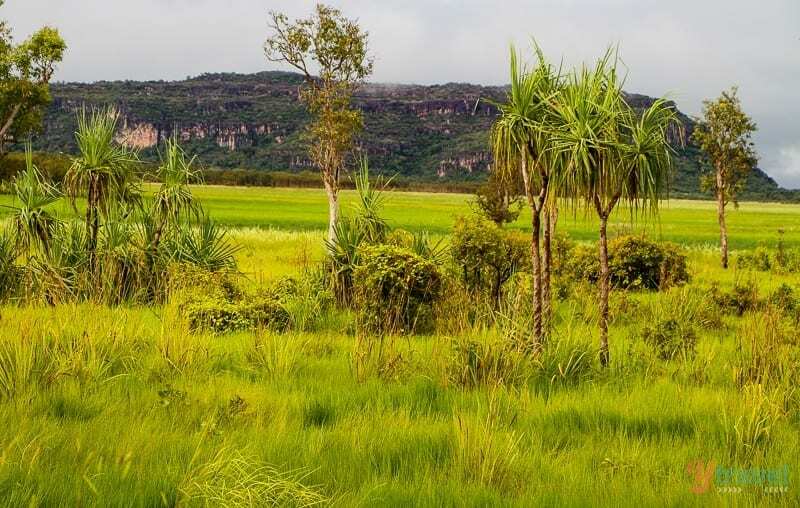 Don’t miss visiting Kakadu and Litchfield national parks. Can you share any tips on things to do in Darwin? Have never timed it so that we have seen the Beer can regatta. But, we plan on spending quite a bit of time in the NT next year so hopefully then. And thanks for the heads up on deck chair cinema. Sounds awesome!! Thanks for the tips on Darwin I’m really looking forward to getting up there! I had no idea that they were known for their sunsets and amazing insight about the free wifi as well! Wow, I’m from Darwin…and sometimes it’s hard to appreciate all the good things you’re home has to offer when you live there. I’ve been travelling abroad for 6 months and now after reading this I’m really missing home! Really great write up of what Darwin has to offer! We recently had 2 weeks in Darwin Phillip. It grows on you the longer you stay! It still might be very humid and rainy. Maybe do some research to find out exactly how much as to whether you can cope. Being a city everything will still be open and running okay!